Greylag Goose is an Old World Goose species belonging to the Anser genus. 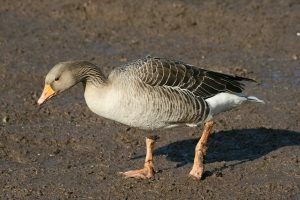 The name is spelled as Graylag Goose in the US. The species was known as the “Wild Goose” or “Anser ferus” during the pre-Linnean times. 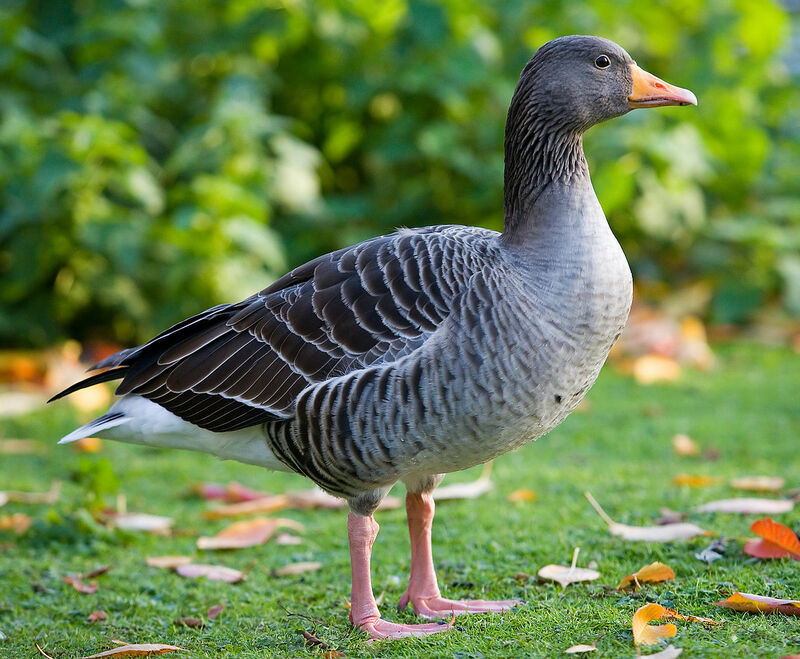 It is the only wild Goose species that can be seen throughout the year in the United States. The Greylag Goose is not generally kept as pet. Size: Their length ranges from 29 inches to 36 inches (74 cm to 91 cm). They have 16.2 inches to 19 inches (41.2 cm to 48 cm) long wings. The females are generally smaller than the males. Weight: The birds of this species weigh from 4.8 lb to 10.1 lb (2.16 kg to 4.56 kg). Color: They have grayish-brown plumage along with darker heads and pale bellies, covered in black spots. The pale outer edges of their feathers pattern their plumages. The upper flanks of these birds are bordered with white. The dark flight feathers form a great contrast with the light colored coverts. Juvenile Greylag Geese do not have spots on their bellies. Body: The Geese have round, plump and bulky bodies with a large heads and long and thick necks. Legs: Their legs and feet are pink in color. The tarsus of this species is 2.8 inches to 3.7 inches (7.1 cm to 9.3 cm) in size. Tail: The tails of these birds grow 2.4 inches to 2.7 inches (6.2 cm to 6.9 cm) in length. Bill: The color of their 2.5 inches to 2.7 inches (6.4 cm to 6.9 cm) long bills ranges from pink to orange. The birds of this species are found all over the Old World. Their distribution range includes various regions of Europe and Asia with the eastern distribution range extending to China. Vagrant Greylag Geese can occasionally be seen in different parts of North America. During their breeding season, these birds can be seen in different parts of the world including Iceland, Finland, Baltic coasts, North Sea, northern regions of Europe in the north and central Eastern Europe, western Russia and the Black Sea in the south. They prefer open wetlands with plenty of grass and vegetative growth. During winter, the Geese live in open cultivated lands, swamps, lagoons and lakes. The diet of this vegetarian bird generally consists of various plant materials including grasses, roots, leaves, sprouts and fruits. It feeds on potatoes, grains and vegetables during the winter months. They spend their time grazing both on land and in water to forage for food. These Geese sometimes perform “upending” by turning upside down in the water. This Goose species is social in nature. They often fly in large flocks. They are known to roost and feed in groups except for the breeding season. Their nesting takes place in loose colonies during the reproductive season. Greylag Goose pairs maintain lifelong bonds. Various animals as wells as birds are known to prey on the Goose species. Their predators include Foxes, raccoons, coyotes, owls and snapping turtles. Crows may sometimes feed on the Greylag Goose babies. These bulky Geese continuously defecate while foraging to keep their guts lightweight so that they can fly away quickly in any emergency. This is a useful adaptation that help the large and heavy Geese to avoid being preyed on. Their bills are specially adapted for probing in marshes and grazing in grasslands in order to dig out bulbs and roots. Their relatively inconspicuous coloration helps them to camouflage themselves in bushes and shrubs, making it hard for the predators to find them. These birds run over the surface of the water before taking off, due to their heavy body. But their large and strong wings make them excellent fliers. They move their wings very fast continuously for maintaining a direct flight. The oldest Greylag Goose leads the way when many birds from this species fly in a large flock. They descend their legs first while landing onto the water surface. The birds glide over the surface for some time before landing. The Greylag Geese make a high pitched, trisyllabic cackling sound. Sometimes, they make loud honking sounds that resemble the call of domestic Geese. The birds also make deep flight calls that sound like “aahng-ahng-ung”. Their calls can be heard from long distances. Greylag Goose is a migratory bird species. They leave their breeding nests and migrate to the southern ranges of their distribution during winter. Their migration range extends to the southern parts of Europe and Asia. The breeding season of this species starts in the months of March and April. 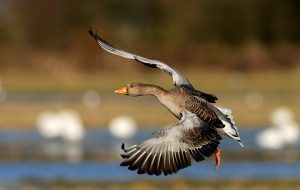 Mating season for the UK population of Greylag Goose begins in April and continues through the end of May. 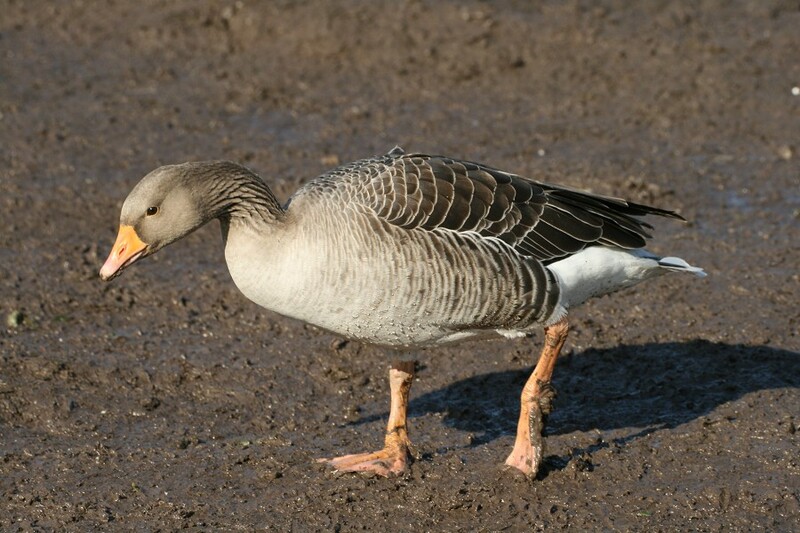 Greylag Geese become reproductively mature once they are 2 to 3 years old. Both the male and female Geese build the nest on ground or on trees, before breeding. 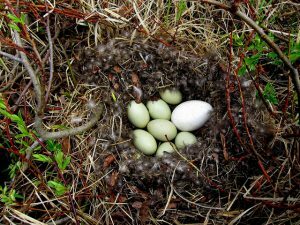 When the nests are situated on the ground, the Geese keep their nests hidden among grass and bushes. The females lay 4 to 8 eggs during each reproductive season. 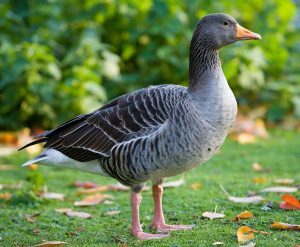 The incubation period for the Greylag Geese lasts for around 28 days. Female Greylag Goose displays egg-retrieval behavior. It collects the eggs that are lying adjacent to its nest and adopt them. These eggs could be of some other bird species. 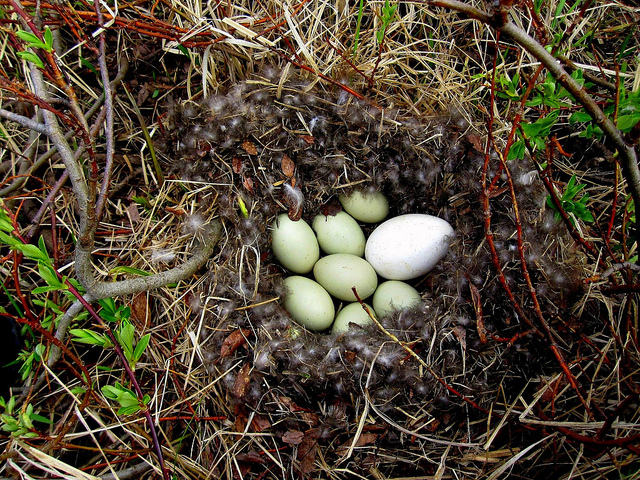 They bring these eggs to their nests using the same behavior they use for retrieving their own displace eggs. The Greylag goslings remain with their parents until they become properly mature. Both parents teach the goslings to collect food and to avoid predators. The young birds do not leave their families until the following year, when the adult birds are ready to breed again. During the winter, the goslings and their parents migrate together with a large flock of Geese. Their average lifespan ranges between 8 years and 10 years in the wild. It is listed in the “Least Concern” category as there are no immediate threats to its existence. The Agreement on the Conservation of African-Eurasian Migratory Waterbirds or AEWA applies on this bird species. They can live in a wider types of habitats compared to other Geese species. Their name “Greylag” is derived from the fact that they are the last Goose species to migrate and each year they “lag” behind the other Geese. The birds are well-known for being the species used by Austrian ethologist Konrad Lorenz for his major study about imprinting in animals and birds. Their calls are deeper compared to that of other grey Geese. 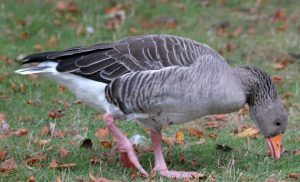 The gander or adult male Greylag Goose permanently stays with its family group. They are the ancestor of the Domestic Goose or Anser domesticus. Here are some images of these graceful birds.